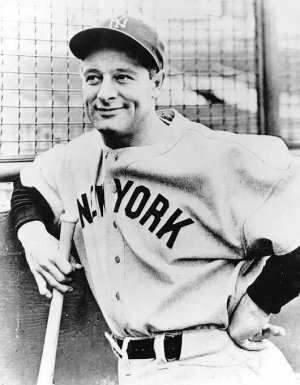 On June 3, 1932, Lou Gehrig and the Yankees travelled to take on the Athletics in Shibe park. These two teams were the dominant teams of the late 20s and early 30s, yet surprisingly only 7300 fans were in attendance for the game. Those 7300 never forgot what they saw that day. Gehrig stepped into the batters box in the first inning to face the Athletics George Earnshaw. Gehrig blasted a pitch from Earnshaw over the wall in left center. In the 4th inning he took one over the right field wall.But the A’s formidable offense came roaring back, and they took an 8-4 lead into the top of the 5th. But Gehrig hit his 3rd home run to get NY back in the game, and Connie Mack pulled Earnshaw. He should have left him in. The A’s bullpen imploded, allowing 13 runs in 4 innings of work. In the 7th inning, Gehrig batted again. And he homered again, this time to right off Rube Walberg. Incredibly, lost in the hubbub over Gehrig’s day, few people noticed that his teammate Tony Lazzeri hit for the cycle! The Yankees won the game, 20-13. The Yankees were in the midst of an amazing 108-47 record that year, which culminated in a sweep of the Cubs in the World Series.